Aquaguard Reviva Review (Detailed). Know all the Specifications, Pros & Cons. Aquaguard Reviva Review (Detailed). Know all the Specifications, Pros and Cons. If you are looking for Aquaguard Reviva review then you are at the right place. 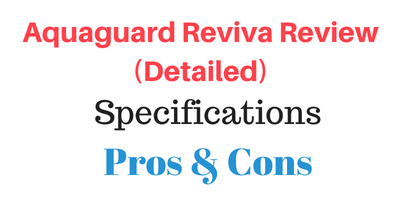 Here I am going to review Aquaguard Reviva and you will get to know all the specifications as well as pros and cons of this water purifier. First let’s see the overview of this water purifier. Aquaguard reviva has a very strong body and it comes with RO and UV water purification technology as well as it also comes with a TDS controller. This water purifier can purify any kind of water whether it is hard water like bore well water or soft water like water for Municipal water supply or water from water tanker as well. Aquaguard Reviva comes with 8 litre water storage tank. Aquaguard reviva has a very strong robust body. It has got fairly compact design so it will not look bulky in your kitchen and also it will not take much space of your kitchen. This water purifier comes with dual flow tap for dispensing water and it comes with a transparent water storage tank. So it is very convenient to know the water level in the water storage tank. Now let’s see the purification of this water purifier. Aquaguard Reviva comes with RO and UV water purification technologies additionally it also comes with a TDS controller as well. This water purifier completes its water purification in 9 stages. Now let’s have a look at each of its stage and its filters. The first stage of purification has i-Filter which removes physical or visible in period is like dust, dirt, mud and sand from the water. The second stage of purification has Chemi-Block Filter which removes harmful chlorine and chlorine by-products from the water. Usually Municipal water contains harmful chlorine and chlorine by-products because it is treated with chlorine for the purification. Additionally it also removes bad taste and odour causing contaminants from the water. The third stage of purification has Mineral Guard. The Mineral Guard prevents the deposition of dissolved minerals such as calcium and magnesium on the Quartz tube of UV chamber, which increases the availability of the minerals in the water. Fourth stage of purification has membrane life enhancer which basically works as a protector for a RO membrane. It removes dissolved solids from the water which may get deposit on the membrane which enhances the life of the membrane as well as purity of the water. 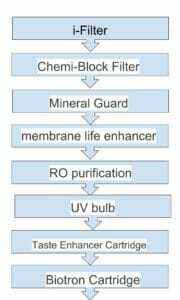 RO purification comes in at The fifth Stage. This stage is consist of RO membrane. Water is passed with a great force through this RO membrane which removes harmful dissolved salts and solids. It also removes harmful heavy metals like lead, mercury and arsenic from the water. Ultimately converting hard water into soft water. Additionally it also removes microorganisms such as bacteria, viruses, protozoa and cysts from the water. E boiling comes in at the 6th stage of purification. This stage of purification is consist of UV bulb. At this stage water is exposed to the UV rays of the UV bulb which inactivates harmful bacteria, viruses and Protozoa from the water. Aquaguard Reviva comes with a 5 watt UV bulb which is very low. So this UV bulb would not be much effective in inactivating harmful bacteria and viruses from the water. Usually water purifiers comes with at least 8 watt UV bulbs. If you want water purifier with high power UV bulb then you should consider Kent Grand Plus or any other Kent Water Purifier which comes with UV water purification technology. Because Kent Water Purifiers comes with high power 11 watt UV bulb which are very effective in inactivating harmful bacteria, protozoa and viruses from the water. The 7th stage of purification is consist of Taste Enhancer Cartridge which has activated carbon filter. At this stage the remaining organic impurities are removed from the water and the carbon filter polishes the water which gives it sparkling look and it also enhances the taste of the water. The eighth stage of purification is consist of Biotron Cartridge. At this stage the Complex water molecules are breaks down so that it will be a lot easier for your body to absorb them. It ensure that you get as much goodness of the water as you can as well as all the nutrients of the water. With the 8 stage water purification Aquaguard Reviva has a very solid purification solution for any kind of water. As this water purifier comes with RO and UV water purification it will remove all the disease causing contaminants from the water which can cause serious diseases. Aquaguard Reviva also comes with a TDS controller which as the name suggests allows you to control the TDS of the water. TDS controller is essential in RO water purifier because when the water is purified with RO water purifier then the TDS of the water is reduced by 90%. High TDS water is bad for health but a water having too low TDS is also bad for health. so with the TDS controller you can literally control TDS of the water as per your wish. The TDS of the water between 250 to 500 is considered as ideal for drinking. Although acceptability may vary according to circumstances. Aquaguard Reviva comes with 8 L water storage tank which is transparent as well. So you can easily keep track on the level of the purified water in the water storage tank. Users are very happy with the purification of this water purifier. They also found the maintenance cost of this water purifier quite low. As this water purifier require stand and additional pre filter, some users found it inconvenient. Aquaguard Reviva comes with one year warranty. If you are looking for a simple water purifier with a good water purification then Aquaguard Reviva is ideal for you. This water purifier comes with RO and UV water purification technologies, which removes all the disease causing contaminants from the water. Additionally this water purifier also comes with a TDS controller which qualifies it to purify any kind of water whether it is hard water like bore well water or soft water like water from Municipal water supply or water from tanker. It also comes with a large 8 litre water storage tank which is transparent as well so you can easily keep track on the purified water inside the water storage tank. This water purifier comes with a unique advanced Biotron Technology which basically breaks down the complex water molecules so that it will be a lot easier for your body to absorb them, which ensures that you get most out of the purified water and all the nutrients of it. Overall users are very happy with the purification of this water purifier they also found the maintenance cost of this water purifier quite low. As this water purifier will require additional stand, some users found it inconvenient. Click here to see customer reviews at Amazon. This was all about Aquaguard Reviva review. If you have any doubts please check out the FAQ section below or leave a comment and I will try to answer all of your queries. When do we will have to change its filters? It really depends upon the quality of the water is purifies also the quantity of the water is purifies. Usually you should change its filters after approximately 6000 litres to 8000 litres of water purification or after five to six months (whichever comes early). What is the maintenance cost of this water purifier? The annual maintenance cost of this water purifier is approximately 3000 to 5000 rupees. Does this water purifier remove fluoride from the water? Yes. This water purifier removes fluoride from the water as well as all the dissolved salts and solids and heavy metals from the water. Aquaguard Reviva is equipped with a unique, advanced Biotron Cartridge which basically breaks down the complex water molecules so that it will be a lot easier for your body to absorb them. The biotron technology basically insurance that you get most out of the purified water and all the nutrients from the purified water. What is the power of the UV bulb of this water purifier? Aquaguard Reviva comes with a 5 watt UV bulb, which is very low and it would not be much effective in inactivating harmful bacteria and viruses from the water. If you want a high power UV bulb then you should consider Kent Grand Plus or any of the Kent Water Purifier with UV water purification Technology because Kent Water purifiers comes with high power 11 watt UV bulb. Which water purification technologies does this water purifier have? Aquaguard Reviva comes with RO and UV water purification technologies. The RO purification removes dissolved salts and solids as well as heavy metals like lead, mercury and arsenic from the water. The UV purification removes harmful bacteria, viruses and protozoa as from the water. Additionally Aquaguard Reviva also comes with a TDS controller which as the name suggests allows you to control the TDS of the water. What is the applicable TDS range of this water purifier? What is the water flow rate of this water purifier? The water flow rate is usually depends upon the quality of the water it purifies and also the filter life of the water purifier. Usually the flow rate of this water purifier is approximately 15 litres per hour. Does this water purifier comes with a pump booster? Yes Aquaguard Reviva comes with pump booster having voltage of 24 V.
What is the overall power consumption of this water purifier? Is this a wall mountable water purifier? Yes this is a wall mountable water purifier and you can use it as a tabletop water purifier as well. Does this water purifier comes with a pre filter? No this water purifier does not comes with a pre filter. You will have to buy it separately. Usually pre filters are cheaper online. You can check the price here. What is the cost of the stand of this water purifier? The cost of the stand of this water purifier is around 150 to 50 rupees. Does this water purifier comes with warranty? Does this water purifier comes with a TDS controller? Aquaguard Geneus Review (Detailed). Know all the Specifications, Pros and Cons.